Boris Loutzkoy (also spelled Lutskoi, Luskoy, Lutsky, and probably other ways) was a Russian engineer who went to Germany to continue his education in the 1880s. Initially, his main interests were with internal combustion engines and automobiles, but it was not long before Loutzkoy turned his focus and engineering talents to aviation. The tandem-engine Rumpler-Loutzkoy-Taube employed coaxial propellers that rotated the same direction. The second engine can just be seen behind the first engine and between the wings. Note the aircraft’s double main wheels. By 1911, he had teamed up with Rumpler Flugzeugwerke in Berlin, Germany to test an innovative propulsion concept. Loutzkoy’s idea was to use two engines to power separate propellers on a common shaft. Since the propellers shared the same shaft, they were coaxial. However, they were not contra-rotating, because they rotated the same direction. The propellers in Loutzkoy’s system were of different sizes and turned at different speeds. Loutzkoy believed this power arrangement would improve the aircraft’s low- and high-speed performance, with the twin propellers achieving a level of efficiency beyond what could be obtained with a single propeller of any size. In addition, two engines with separate propellers would provide a level of reliability well beyond that of a single power plant. At the time, engines were notoriously unreliable. 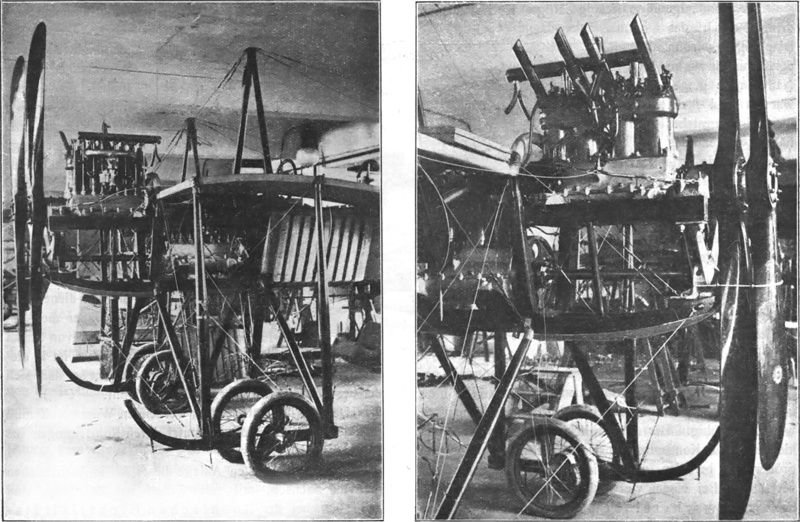 To test his theories, Loutzkoy made many modifications to a Rumpler Taube aircraft. The Taube (Dove) was designed in 1909 by Igo Etrich of Austria-Hungary. The aircraft first flew in 1910 and proved to be very stable. A number of manufacturers purchased licenses to build copies, and Rumpler probably produced the most. The Taube was a monoplane with a mostly wooden frame. The front of the aircraft and back to the cockpit was covered in metal, but the rest of the aircraft was fabric-covered. The Taube used wing warping for roll control. This drawing of the Loutzkoy-Taube illustrates the aircraft’s similarity to a standard Taube. The obvious differences include the double propellers and two main gear wheels. 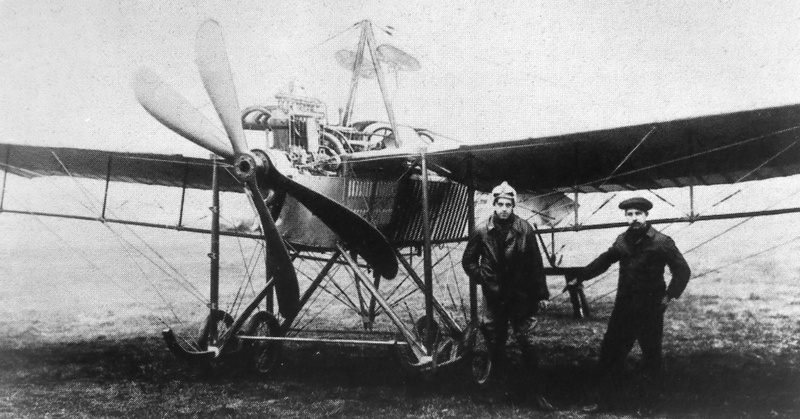 The Loutzkoy-modified aircraft was named the Rumpler-Loutzkoy-Taube. Changes from a standard Taube included a slightly modified and strengthened airframe, strengthened landing gear (including double wheels), and a slightly larger wing. These changes were made to handle the extra weight and power of a second engine. The approximate dimensions of the Loutzkoy-Taube were a wingspan of 49 ft 10 in (14.3 m) and a length of 34 ft 1 in (10.4 m). The aircraft weighed around 1,764 lb (800 kg) empty. The Loutzkoy-Taube had a top speed of 93 mph (150 km/h), about 31 mph (50 km/h) more than a standard Rumpler Taube. Powering the Loutzkoy-Taube were two Argus Type 4 engines. The Type 4 was an inline, four-cylinder, water-cooled engine with a 5.51 in (140 mm) bore and stroke. The engine displaced 526 cu in (8.62 L) and produced 100 hp (75 kW) at 1,300 rpm. The two engines drove separate propellers that were mounted on a common shaft: the front engine drove the front propeller, and the second engine drove the second propeller. Both sets of propellers had two blades. 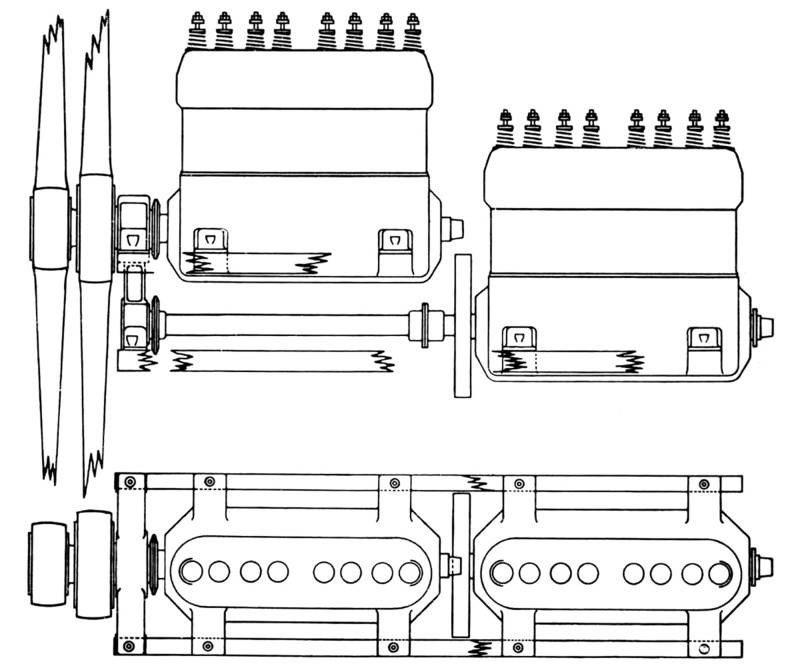 A basic drawing of the engine installation in the Loutzkoy-Taube. The front engine was positioned in its normal location, in the nose of the aircraft. However, rather than having its propeller mounted directly to the engine, a short extension shaft was used. The second engine was mounted behind and below the front engine. Power from the second engine was transferred to the front of the aircraft via an extension shaft that ran under the front engine. A sprocket on the end of the extension shaft was connected via a chain to the second propeller, which was positioned between the first propeller and the front engine. Although the propellers turned the same direction, the second propeller was a larger diameter, turned at a slower rpm, and had a coarser pitch. The first propeller was 8 ft 2 in (2.5 m) in diameter, direct drive, and turned about 1,300 rpm. The second propeller was 9 ft 10 in (3.0 m) in diameter, had a .615 reduction through the chain-drive, and turned around 800 rpm. The aircraft could be flown on either engine if a failure occurred, but the intention was to have both engines operating at all times. A drawing from Loutzkoy’s patent shows the basic engine layout that was used in the Loutzkoy-Taube aircraft and includes a change-over gearbox. 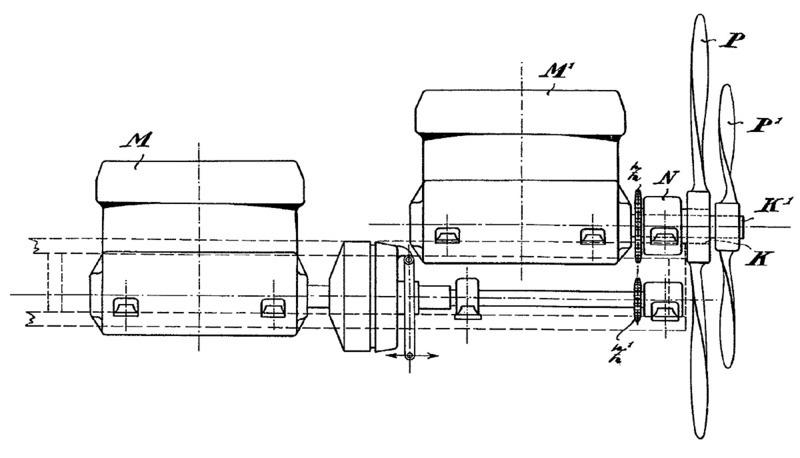 The gearbox was meant to provide braking after touchdown by reversing the rotation of the second propeller. However, such a gearbox was never installed in the aircraft. In his German patent no. 263,059 (granted 29 October 1911), Loutzkoy explained how a change-over gearbox could be used to reverse the rotation of the second propeller. This feature would be used for braking after the aircraft landed. In flight, shortly before landing, the second engine would be stopped and the change-over gearbox engaged. The second engine could then be started on touchdown. Its propeller rotating in the opposite direction would slow the aircraft down. Most aircraft at the time did not have any brakes, and using the propeller as a brake would become common with turboprops. However, the reversing propeller idea was never implemented on the Loutzkoy-Taube aircraft. Detailed right and left views of the Loutzkoy-Taube’s twin-Argus engine installation. Note the size difference of the propellers. The extension shaft and chain drive from the second engine to the larger propeller can clearly be seen. The Loutzkoy-Taube was first flown in early 1912, possibly in February, at Johannisthal airfield, near Berlin. With a combined rating of 200 hp (149 kW), the Loutzkoy-Taube was one of the most powerful and fastest aircraft of its time. A number of subsequent flights were made, and Hellmuth Hirth was the pilot for most of the Loutzkoy-Taube’s flights. The aircraft passed an inspection test for the Russian Army on 8 March 1912, achieving a speed of 81 mph (130 km/h). The Loutzkoy-Taube was displayed at the Berlin Airshow in April 1912. However, engine drive issues continued to plague the aircraft. By 1913, Loutzkoy had moved on to another aircraft project. Nothing more was heard of the twin-engine Loutzkoy-Taube and its coaxial propellers. While it was not the first twin-engine aircraft to fly, the Loutzkoy-Taube was certainly the first aircraft to fly using coaxial, non-contra-rotating propellers. A very small number of aircraft have used this method of propulsion, as it really does not have many advantages over a single propeller and has disadvantages over contra-rotating propellers. Still, Loutzkoy’s ideas demonstrate innovation and creativity in the early days of aviation. This rear view of the Loutzkoy-Taube illustrates the aircraft’s similarity, with the exception of the double propellers, to a standard Taube. Note the fuel tanks attached to the cabane strut above the cockpit. This entry was posted in Aircraft, Through World War I on 5 May 2017 by William Pearce. “The second propeller was 9 ft 10 in (3.0 m) in diameter” – that seems to be a pretty big propeller! William, would you happen to know what is the largest diameter size of a propeller that was fitted to an aircraft? Not off the top of my head, but below are the largest I found after looking around a bit.